Bread baking is part recipe, with a bit of art and expertise added. The recipe is merely a starting template, a base from which to launch your own delicious, fluffy breads. Most people believe that today’s white flour rolls are the lightest and fluffiest, so soft they seem to not even need butter to create the texture and flavor we crave. When you first try crockpot dinner rolls, you will be amazed at the taste and texture that these rolls bring forth. Our favorite recipe uses wheat flour and a blend of herbs, to create a dinner rolls that will delightfully compliment your dinner entree. While it is possible to create crockpot dinner rolls using a standard white flour, the extra flavor and outstanding nutrients provided by these wheat rolls will be all proof you need to forever turn from their white flour cousins. White flour is actually wheat flour, with the nutritious bran removed through one of several refining processes. Some is bleached white, through a refinement process that uses bleaching agents that are banned in several countries for their health concerns, while unbleached has a tan tone, but neither form contains the fibrous bran that adds so many nutrients and fiber. For more information on the nutritional differences, see whole wheat flour benefits. Another good explanation of the value of whole wheat over the refined white flour is healthy facts. The problem with whole grain flours is that they produce a denser product, as less air is incorporated into the dough. Although the density is not a problem for many, there is a way to increase the air content, thereby creating a lighter, fluffier product. To create the lightest breads or rolls using 100% whole grain flours, in a large bowl mix your liquid ingredients together and beat well to aerate. Add the remaining ingredients, except for the flour. Beat to aerate again. The yeast should create a bubbling liquid at this point. Beat or whip in about half the flour. Cover and allow to rest in a warm (75-78F) place for about 4 hours (you may rest it overnight, but no longer than 12 hours is recommended) When you are ready to complete the recipe, mix in the remaining flour, a small amount at a time, to form a kneadable dough. 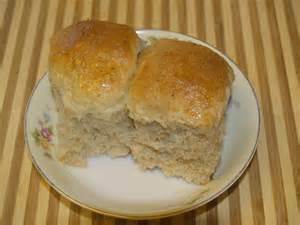 Click here for Crockpot dinner roll recipe. Wow! the dinner rolls look good! I’ve never tired wheat rolls before, but I’ll give it a try. Thanks Brenda. If you are unsure of the darker wheat, white wheat gives you a lighter flavored product, but still contains the health benefits of whole wheat. Wow, I’ve never heard of making rolls in a crockpot! This looks so delicious, too! Thanks for sharing!! Thanks Brittney, they are wonderful! Let me know if you try them! Wow! This is so great that you can make dinner rolls in the crock pot! Thanks for sharing. It is interesting, but it does work very well–let me know if you try it! Look very good…I may get brave and give it a try! Let me know if you try them, Jamie. They are worth the little extra prep! those look amazing and we love bread in my family and to know I can make it in my crockpot makes it even better. Thank you, Angela! If you try them, let me know what your family thinks of them! Those look very yummy! I could eat rolls on its own with some butter and a cup of tea. Thanks for sharing. Thanks, Shaney! Let me know when you try the recipe–I’d like to hear how you enjoy them!